Daniels Landscape Inc. is a fully licensed and insured landscape contractor with over 40 years of experience. We are dedicated to providing high-end custom landscaping services to residential clients throughout Rancho Santa Fe, Escondido, Carlsbad, Vista, Encinitas, La Jolla & nearby coastal areas, Poway, Encinitas, Rancho Bernardo, San Marcos, Bonsall, and surrounding cities. We've served some of the most well-known residents in North San Diego County and worked with many of the community's premier architects to remodel an array of small, medium, and large properties, as well as multi-acre estates. As a testament to our skill in bringing together individual hard-scape, soft-scape, water features, and lighting elements to create a stunning landscape, we've won the California Landscape Contractors Association San Diego Chapter's Beautification Award on multiple occasions. Whether you want to create a grand entrance to set the tone for your entire property or turn your backyard into an extravagant private entertaining space, Daniels Landscape will help you realize your ideas and vision. Our team excels at taking outdoor environments to new levels of beauty and design, improving your property's curb appeal and increasing its value. While our completed landscape projects are breathtaking, they still exude warmth and style. To achieve this, we carefully plan all hard-scape and soft-scape elements to come together harmoniously, so they feel like a natural extension of your home, and execute them according to the industry's best practices. 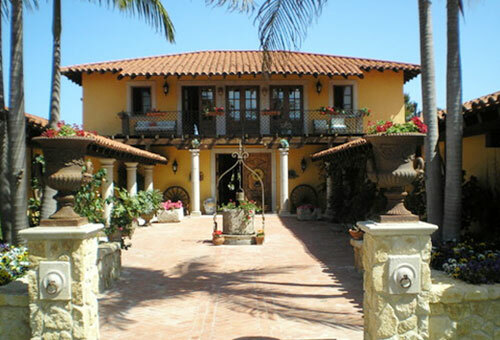 Call us today to schedule your free consultation for estate landscaping services anywhere in San Diego County. 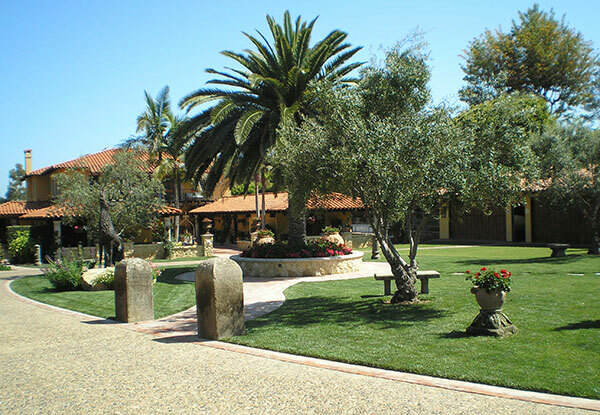 Our attention to detail, skilled workmanship, and fair pricing have earned us a reputation as the best value for full-service, high-end landscaping in Vista, Rancho Santa Fe, Escondido, Poway, Encinitas, La Jolla, Rancho Bernardo, San Marcos, Bonsall, and surrounding cities. All jobs are supervised by our owner, Dan Olsen, and backed by a one-year warranty on materials and labor. This brick and limestone pathway, lined with roman fountains, and a lush green lawn was installed around the entirety of a home in La Jolla, CA. The large palm tree serves as an anchor for the center courtyard with metal sculptures to accent the scenery.